Three days and 30 one-hour levels were not enough for a champion to be crowned in Event 57, the $10,000 No-Limit Hold'em Six-Handed. A fourth day and one more hand was all it took for Gregory Merson to capture his first World Series of Poker bracelet. Earlier this summer, Merson bubbled the final table of Event 28, the $2,500 No-Limit Hold'em Four-Max. Determined to make the final table this time, he entered Day 3 in 12th place out of the remaining 27 players and won a few crucial pots as the final table approached to take a chip lead that he would never relinquish. Holding , Merson called Nick Maimone's three-bet shove and bested his when the board ran out to leave just eight players remaining. The next hand, Merson eliminated Layne Flack after the two engaged in a preflop raising battle, culminating with Flack five-bet shoving for about 35 big blinds with . Merson looked him up with and took down the pot when the board rolled out . That gave Merson a nice chip lead and he maintained it throughout the final table. He eliminated Andrew Lichtenberger in sixth place when his got there again the of Lichtenberger. A flop improved Lichtenberger's hand, but the turn gave Merson broadway. He dodged a heart on the river to score the elimination. 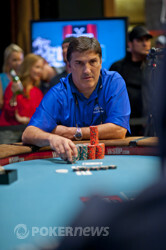 Merson eliminated Eddy Sabat in fourth place when the short-stacked Sabat called all in with . Merson was behind with , but the board fell to give Merson the better two pair. He entered heads-up play with a sizable chip lead after Shannon Shorr ran into Merson's . The board improved neither player, giving Merson the pot with ace high. A winner was not reached on Day 3, so they returned on Day 4 where Merson needed one hand to win the bracelet. An emotional Merson was overcome by the moment as his friends mobbed him in celebration. That wraps up our coverage of Event 57. Thanks for joining us and be sure to keep it here throughout the duration of the World Series of Poker. One hand. That's all it took to play down to a champion here on Day 4. The final hand of the tournament began with Gregory Merson opening to 280,000 from the button. Keith Lehr then three-bet to 915,000 and Merson quickly shoved his large stack. Lehr called all in and the two players turned their hands over. Merson's rail cheered out in joy as the flop was dealt, putting Merson in front. It would all change when a hit the turn. Merson's rail then cried for a jack and that's exactly what they got, with the completing the board on the river. With that, Day 4 is all over within a matter of minutes as Merson becomes our latest champion. The cards are in the air! Two will become one. Tune in to find out who becomes our latest World Series of Poker gold bracelet winner. 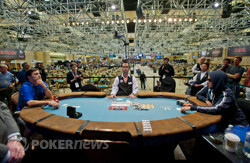 Welcome to PokerNews' Day 4 coverage of Event 57, the $10,000 No-Limit Hold'em - Six-Handed. A field of 474 players is down to just two, each looking to capture the coveted World Series of Poker bracelet, as well as the $1,136,197 first-place prize. Gregory Merson is in the lead with 9,835,000, but Keith Lehr proved last night, despite being the shorter stack, that he won't be an easy out. He has 4,380,000. 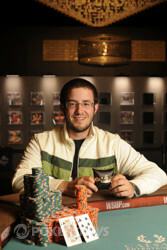 This is Merson's third cash of the 2012 WSOP and his first career WSOP final table. He just missed out on one earlier in the summer when he came in fifth in Event 28, the $2,500 No-Limit Hold'em Four-Max. He's certainly proven his short-handed prowess and a WSOP bracelet will cement that. Lehr, meanwhile, is no stranger to WSOP success. He has a bracelet from 2003 when he won a $3,000 Pot-Limit Hold'em event. 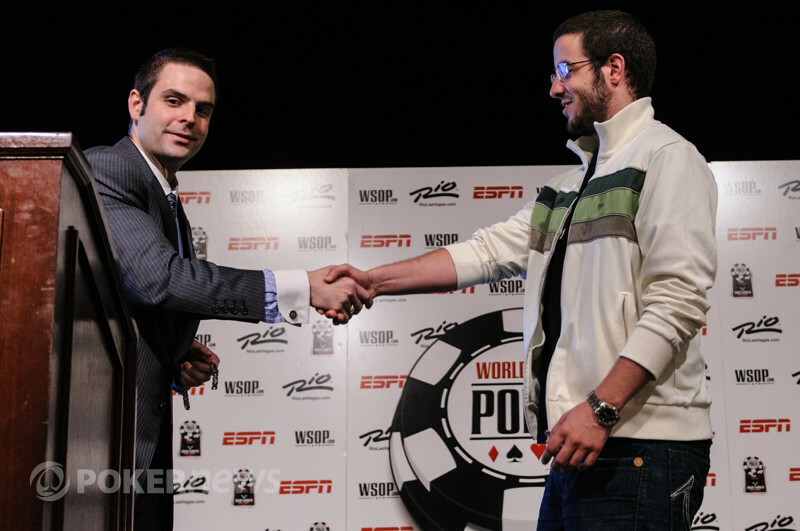 This is his fourth WSOP final table and Lehr hopes to add a second bracelet to his wrist. Play is set to resume at 1:00 PM local time, about ten minutes from now, so keep it here to see who will become the latest WSOP champion!